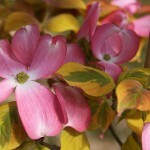 This tree has the unique attributes of abundant red-pink bracts in spring and yellow and green variegated foliage. The new foliage has distinct pinkish-red tips. The fall colors are equally bright as the foliage turns to pinks, reds, and purples. It would make quite a statement in the landscape. Known to be a strong grower. Performs best in moist, well-drained soils with some protection from the hottest sun. A sport of 'Cherokee Chief' and introduced by Commercial Nursery as 'Sunset' in the late 1980's.